Fish and chips meets its match. For a meal that tastes just as good but feels a little bit lighter, try this easy recipe from Taste and See. Put the uncooked sweet potato fries in a resealable plastic bag and add cornstarch. Toss thoroughly until evenly coated, then add olive oil, chili powder, garlic powder, brown sugar and salt, and toss them again. Place fries on a parchment-lined baking sheet and roast at 425°F. Flip once after 15 minutes, then cook for another 10-15 minutes, or until they reach your desired crispness. Remove from oven and set aside to cool. Arrange fish sticks on a fresh parchment-lined baking sheet, leaving space between sticks. Bake uncovered for 12-14 minutes until they are golden & crunchy (flip them after 8 minutes). In a small bowl, mix all Avocado Ranch Sauce ingredients together. If desired, use an immersion blender for a creamier texture. 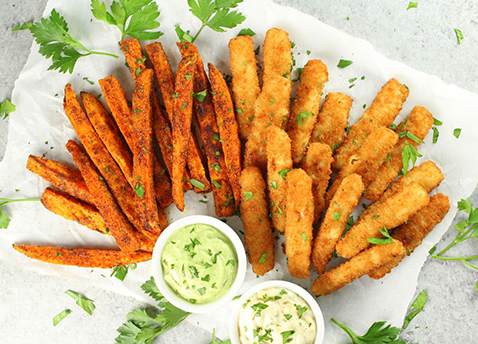 To serve, plate up fish and sweet potato fries along with Avocado Ranch Sauce and enjoy! 2 large sweet potatoes, sliced into ½ inch wide French fries. 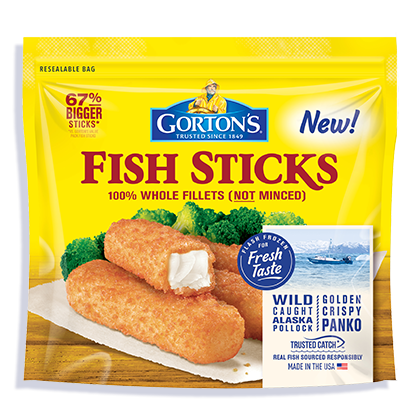 100% real fish sticks in a crunchy golden breading.